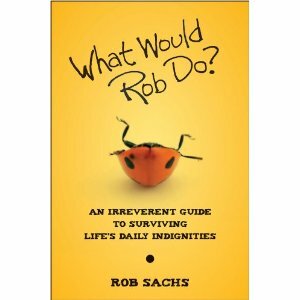 I really enjoy quirky things, so I thought I would really enjoy What Would Rob Do: An Irreverent Guide to Surviving Life’s Daily Indignities by Rob Sachs. Sachs developed this concept of combining unique scenarios (well, many are not unique, but are unique in that they are elements of life that people don’t usually talk about) and discussing his perspective on them. He developed these into a series of podcasts for NPR (National Public Radio) and has, in turned, adapted them into this book. The topics that Rob addresses and provides his perspective on, range from the practical (“Protecting Your Voice. What would Rob do?” and “Matchmaking? What would Rob do?”) to the outrageous (“I’m Naked. What would Rob do?” and “I Clogged the Toilet and I’m at a Party. What would Rob do?”). In his own quirky way, incorporating anecdotes from his own life and information that has been passed on to him by others, Rob provides practical, and sometimes humourous, suggestions about how to deal with these scenarios. I found this book funny, quirky and interesting. I actually learned some things along the way and actually thought some of his ideas had real practical applications if I ever found myself in the situation being discussed (I hope never to find myself needing the section on “I’m naked. What would Rob do?”). I enjoyed this book and would recommend it to those who enjoy reading short sections on a variety of subjects and enjoy somewhat quirky nonfiction. Hello, dropping in from To The Top Tuesday, to say help, I’m already a follower. Have a great day!